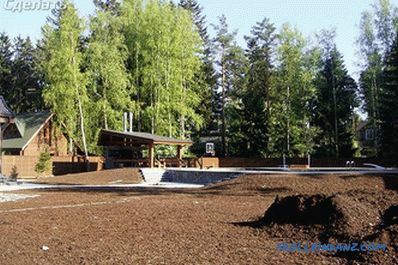 What the landscape design will ultimately completely depend on the relief of the backyard plot. As a rule, people living on a slope dream of a horizontal territory, and those who live on a plain dream of hills. 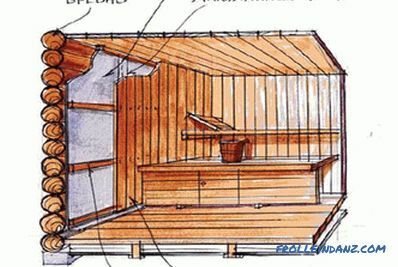 Today you have the opportunity to completely change the relief of the dacha. One solution to this problem is geoplastics in landscape design. 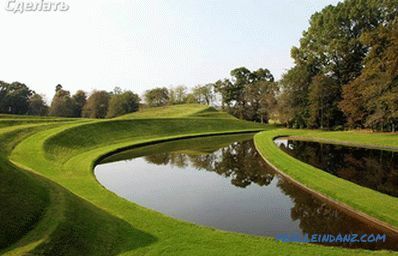 What is this direction in landscape design and how to implement ideas to change the topography of the site? This will be discussed in this article. 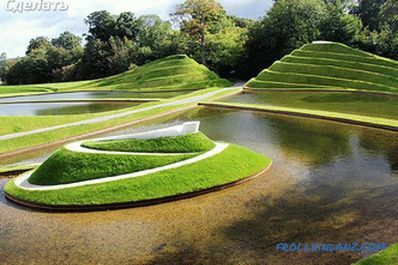 creation of hills, labyrinths, hills and other designs. In the process of geoplastics, the natural reliefs of the site can be restored, as well as new forms with protective functions can be made. 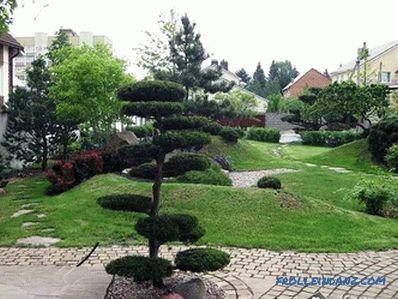 It can be gazebos and sculptures of unusual shape. They can imitate natural slides and islets. 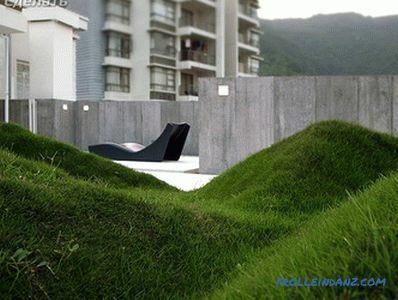 Now we consider the most common type of geoplastic - the construction of artificial hills on the garden. Initially decide what you want to see in the end on an updated piece of land. This way, you will be able to estimate the estimated amount of work and the likelihood that your ideas can really be realized. Not all ideas can be implemented. For example, on a site less than 10 acres, the hills will look unnatural, disrupting the natural balance, as well as all the rules of geoplastics. 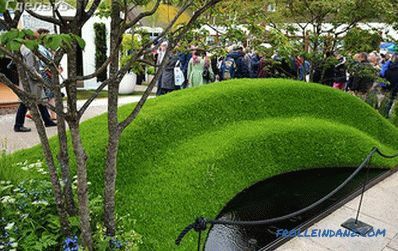 Although an artificial terrain is created in the process of geoplastics, it should still look natural. To achieve this result, it is important to work out each stage of work, starting from the design and ending with the implementation of plans. 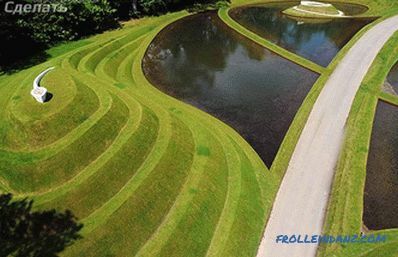 Working with the land is not easy, because you have to create harmonious proportions, without disturbing the natural outlines of the relief. As mentioned above, some summer residents want to get rid of the hills, while others are looking for opportunities to create them. 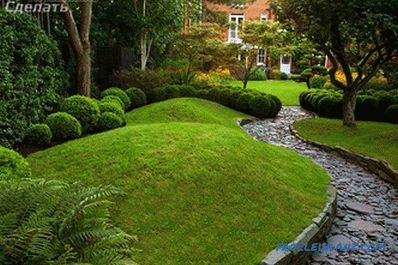 It all depends on your preferences in landscape design and your chosen garden style. The original decoration of the site. For example, you can make a beautiful alpine slide. Comfortable rest on the top of the hill. If you make a gazebo here, you can relax, admiring the beauty of the site from above. 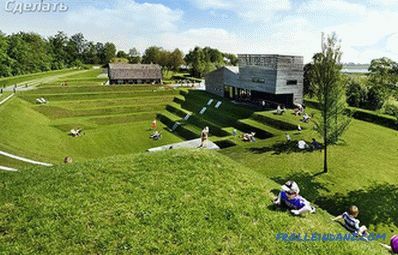 With the help of an artificial hill, you can hide the components of the site that worsen the appearance of the territory: a utility block, a summer shower, a cellar, heaps with compost, etc. You can make an artificial hill at a low cost. 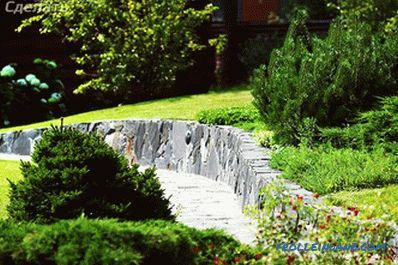 The angle of inclination, as well as the height of the hill, should correspond to the area of ​​the territory, thanks to which you can make it as natural as possible. Best of all the hills look at sites of more than 10 acres. But, if your plot has 6 acres, you can make rock arias on a small hill or rock garden. Create a relief map for the area. If you do not succeed in accomplishing this task yourself, then order a relief map from specialists. They will make you a computer model of the terrain, will put on it all the existing buildings and landscape elements. Also, you will be presented with documents confirming the reliability and safety of the man-made hill. You can make calculations yourself. To do this, you need to mark the territory by dividing it into 10 * 10 m squares if your plot is flat. In cases where the terrain is complex, the marking should be 5 * 5 m or 2 * 2 m. Measurements should be extremely accurate. The tolerance is 5 cm. In the corners of the squares, you need to drive in wooden pegs. They should rise above the ground by 30 cm. Then, using a water level and a ruler, determine the height difference between the pegs, which will help you accurately determine the terrain.The maximum permissible deviation during measurements is 1 cm. Measurements should be taken from the highest point of the section to the lower. 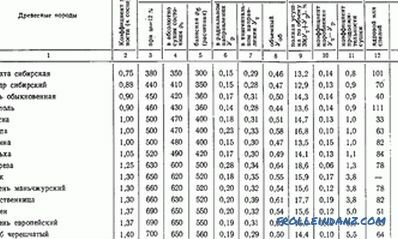 Record all measurements in a notebook. Thus, you can recreate the terrain on paper. 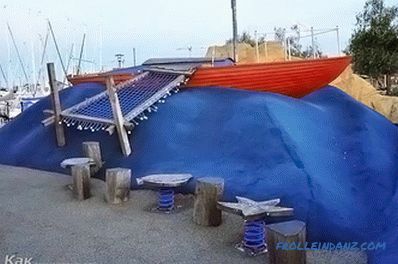 Now you can proceed to the construction of an artificial hill. 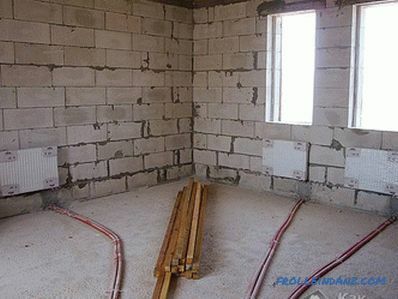 It is best to do the site geoplastics at the construction stage of the summer cottage. So, you will be able to use the land for geoplastics, which remained from digging the foundation pit and other construction works. Otherwise, the land will have to be imported. Clay. This is due to the fact that it swells at high humidity, which will adversely affect the appearance of the hill. 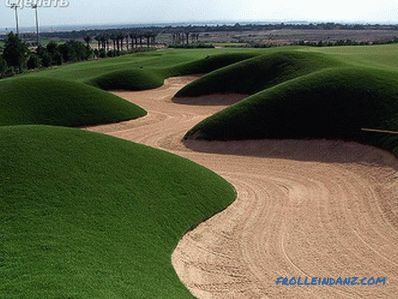 In addition, the clay has a high water resistance, which is why puddles will form on the hill and near it. Humus is the highest fertile layer of soil in which there is a lot of organic matter. Over time, they will decompose, reducing the volume of soil. As a result, the soil of the hill will begin to subside, which will degrade the appearance of the hill. Peat soil. Like clay, it changes volume with increasing humidity. The infertile soil located at a depth of 40 cm and deeper is best for geoplastics of the hill. It is also possible to use technical primer for these purposes, provided that it is pre-cleared of debris. 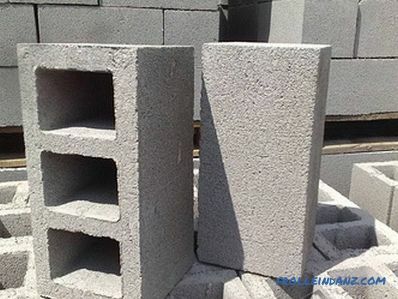 To save on the volume of soil, the use of bulk structures, such as rings made of reinforced concrete or old automobile tires, is allowed. So, after you have made a relief map, determined the location of the hill and brought the material for the construction of the hill, you can proceed to business. 2 buckets of 10 liters. Mark the area around the future hill. This will help you pegs and cord. Then, on the marked area, remove the fertile soil layer, which is usually about 30 cm. The lighter the color of the soil, the less it is fertile. If your estate is on sandy rocks, then the fertile layer will be quite small, just a few centimeters. 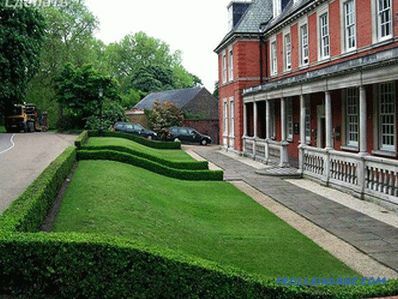 To make a hill you need to cover the prepared area with barren soil. 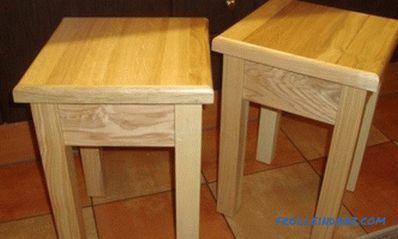 To make it look presentable, it does not need to be made too high (no more than 1.5 m). In this case, the angle of inclination must not exceed 45 °. 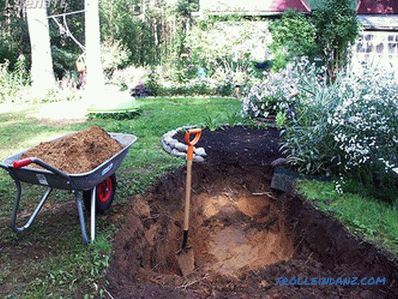 To make the wheelbarrow easier to move on a hill, you need to pave a plank walkway, which will allow you to pour out the soil on both its sides. In order for the embankment to be even, it is necessary to change the track location from time to time. 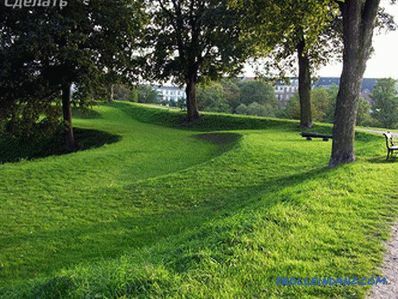 In order for a man-made hill to become suitable for decoration, the embankment must give a natural shrinkage. It will take about 6 months. No desire to wait? In this case, tamp the ground with a special machine after every 30 cm of sleep. The tamper must be repeated after the hill is completely covered. In this case, you can pour all the irregularities in the soil and roll up the surface again, this time using a lawn roller. Strengthen the hill in advance. 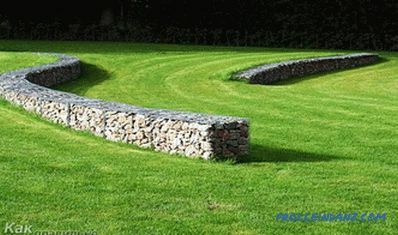 To protect it from weeds, you can use a special film, on top of which you will lay a geogrid or geogrid. Thus, you will increase the stability of the slope. 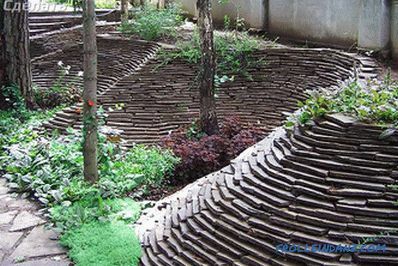 The geogrid should be covered with a layer of fertile soil by 5 cm. Now you can decoration of the hill. 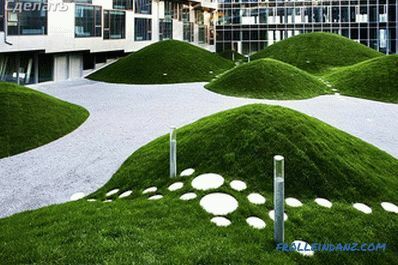 To do this, you can use a turf with grass cover. 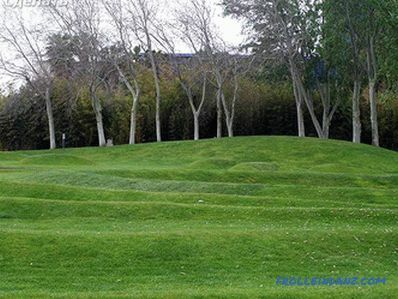 You can also make a recreation area on the hill and plant ornamental plants on it. In order to avoid the destruction of the hill structure in the future, do not plant tall trees on it, the root system of which will negate all your efforts in geoplastic. The presence of a large number of trees in the area that can not be cut down. 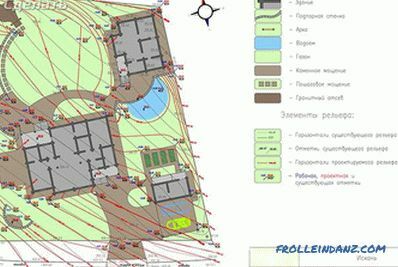 Before you make a plot of the site and create a geoplastics project, consult with experts about the above situations. The site's geoplasty is a very interesting job. However, its implementation should be approached with full responsibility. If you have experience in this matter, then write comments to the article.